This product eliminates fabric wear caused by friction. This was accomplished by using a belt that supports over 25% of the circumference of the fabric at all times. 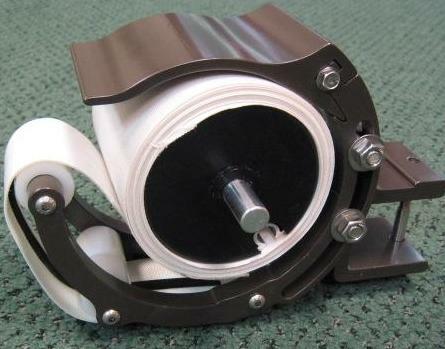 The belt rides on two independent rollers which are installed on six stainless steel precision sealed ball bearings so you never have to worry about corrosion or dirt hindering the bearings from rolling freely. The belt itself was designed in conjunction with Eastern Awning Systems and a specialty belt manufacturer & has a coating that will not damage the fabric. 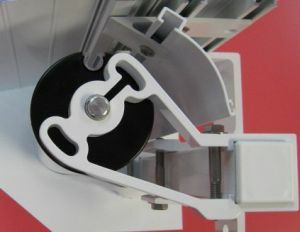 The belt has a special guide system that keeps the belt tracking straight. While the belt eliminates fabric wear, it will not eliminate dirt from showing at the support contact point nor will it stop fraying from poorly woven fabric at the selvage end. It is offered as the standard center support on all new SUNFLEXX® awnings (20' wide and larger) and also as a retrofit for all existing SUNFLEXX® awnings. Nest Arrestor for SUNFLEXX® awnings. This product is a valuable new accessory for your SUNFLEXX® retractable awning that will eliminate the problem with birds nesting on your awning. This nest eliminator is only for SUNFLEXX® awnings equipped with protective hoods. When properly installed, this inexpensive and simple retrofit product will stop birds from building their nests under the protective hood by closing off the area behind the roller tube. Best of all, you will stop the bird droppings that soil the fabric and you will no longer have to be concerned about harming baby birds or destroying a nest with eggs. This accessory is available in White, Bronze, or Ivory to match your existing awning. Torque Sensitive RTS Motors by Somfy. A new line of Somfy motors are now available through Eastern Awning Systems. These motors use a torque sensitive control system to continually adjust the inner and outer limits of the motor. There are two major benefits by using this type of motor. It virtually eliminates any fabric sag caused by unavoidable fabric stretching along with always keeping your awning closed tightly and thus completely covered by the hood. The latter will help keep the fabric clean by protecting it from the elements. Send E-Mail To Eastern Awning • Call Eastern Awning 800-445-4142 © 2014 Eastern Awning Systems, Inc. All rights reserved.